Our goal at Isaac’s Moving and Storage is to provide you with as accurate an estimate as possible so there are no surprises on your move day. If you have any questions before, during, or after the estimate, please feel free to call your move consultant. For local moves we charge per hour. The hourly rate is determined by the number of movers and trucks that the job requires. 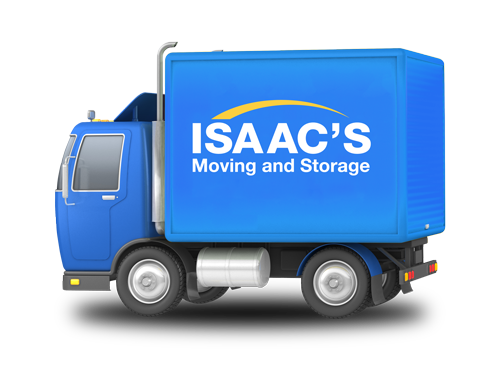 Your Isaac’s representative will determine the appropriate number of trucks (usually only one) and movers based on the circumstances of the move. He will then apply the correct rate and estimate the number of hours for your move. If we have to pack items at the last minute or more items are added to the move, that could inflate the cost so make sure you discuss this with the Isaac’s representative before the move. Packing and unpacking into/out of boxes is an extra service we offer and is charged by the hour. Packers will usually work the day before the move as this can be a different team from the movers. Packing materials are supplied and are charged based on actual usage. Standard limited liability insurance is included in the price. Optional valuation coverage can be purchased on the day of the move. (Click here for more about valuation coverage). Long distance charges are based on weight and distance as determined by the 400-N interstate tariff. An Isaac’s Moving and Storage representative will visit to survey what is being moved and the size/weight/volume of the shipment and provide an Estimate of Cost List. It is the customer’s responsibility to check that all items to be moved are on the Estimate of Cost list, so check carefully. If you feel as though you may have more or less boxes on the move day than our estimator has estimated, please bring it to his/her attention. The estimate will be adjusted accordingly. For a long distance move, packing is charged by the box rather than by the hour. The price per box depends on the type of box. The charges for packing include the materials themselves. If the inventory list has changed in any way, or if you have changed your mind about what you would like packed, please call our office so we can recalculate your estimate and make proper arrangements for your move. International Moves are based on volume and destination and the costs include many charges and fees from different stages of the move (example: customs clearance, destination ports fees, port storage and more). Working with a good international shipping company is critical to make sure they take responsibility and quote you for all the components of the move and if they do have to leave items out because they are unknown, they tell you what they are. The quote will include items at the origin country, the shipping line and at the destination country. Remember – know the laws in your destination country about import duties as this will not be included in the quote and is your responsibility. Typically, the shipping company will sign the contract with you, send you the bill, and be responsible for solving any issues or claims you have. It is important to keep constant contact with the shipping company to know where your shipment is and avoid any delays, paperwork complications or additional charges.